Looks like what ever the problem was with the blog loading is now fixed. 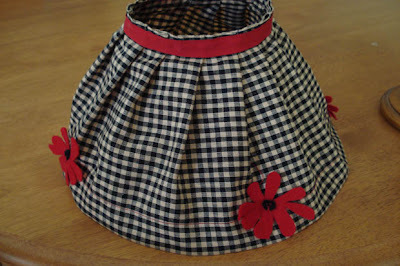 I thought some of you might like some more details on the lamp skirt. I've made a few of these and have always done it the same way but I have seen them gathered at the top with elastic as well. I pleat mine. Basically all you need to do is measure the circumferance of the lamp shade at the lower/larger end. Find a piece of cotton or linen fabric twice that length and a little wider than the depth of the shade. You need to hem top and bottom, so add another few centimetres for your hems. Making fairly large pleats, pin each pleat in place and when you've got it all done to your liking, sew and iron the skirt. I've gone over the top of mine with some crossgrain ribbon and stitched again. You can put anything, or nothing, along the hems. 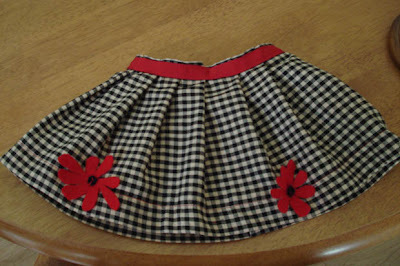 The good thing about these little skirts is that you can change them as often as you like, depending on how much fabric you have on hand. 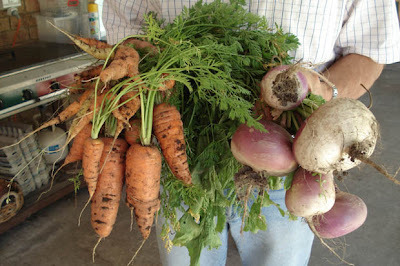 H has been in the garden and just came in with a nice little harvest of carrots and turnips. I think I might blanche these and put them in the freezer for later in the year. 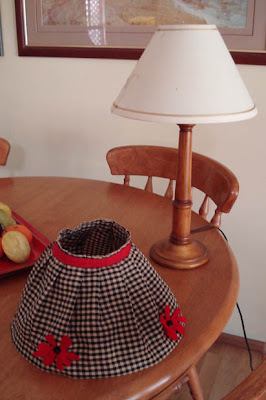 What a delightful lamp skirt! Such a clever idea. I love homemade soft furnishings for the house. There is something about them that whispers of comfort and home in a way that something mass-produced never can. I must say Rhonda, I am very envious of your vegetable garden. I could see the crunch in those carrots! My vegetable garden is a barren wasteland at present. We are unfortunately, without tanks, and the last time I hosed anything in my garden was the day after I came home from hospital with my last baby who I might add, is about to turn three. You have a beautiful home and garden. Those are the yummiest looking carrots I've ever seen!